The client is a leading player in the specialty drugs market based out of the United States. With several years of expertise in drug development, they were looking at leveraging healthcare analytics to make a remarkable entry into the oncology drugs segment through the introduction of a new oncology drug. The healthcare industry today is amidst major tectonic shifts. The ongoing regulatory changes coupled with far-reaching patient protection and affordable care act in the United States are prompting leading players to change their status quo. Besides the increasing costs of regulatory compliance, healthcare players are also facing rising research and development costs. Though the increased regulatory supervision has turned out to be a major burden. Such regulatory requirements are putting in place a solid foundation for healthcare analytics, which, in turn, can be used to drive major organizational transformations. By using this opportunity organizations can extract additional value from patient data and leverage it to create a competitive differentiation. Though the specialty drugs market continues to exhibit a massive sales growth with the introduction of more targeted therapies, it has become increasingly challenging to monitor and understand how therapies are being utilized by physicians. This challenge is further compounded by the complexity of the oncology drugs market where treatment decision options are highly personalized to each patient’s genetic profile. Facing similar predicaments, a leading pharma company approached Quantzig to leverage its healthcare analytics expertise to successfully launch their new oncology drug. Request a FREE Demo to uncover the true potential of healthcare analytics. The client needed to adopt a sophisticated analytics-based approach to gain detailed insights into physician and customer journeys. Limited insights into market dynamics and understanding of customer decision making prevented them from gaining a complete view of the market. Though the new product launch strategy looked promising, the client had to gain better insights on stakeholder interactions and process data, as multiple stakeholders were involved in the oncology drugs segment. The company also needed to develop a post-launch analytics strategy to assess the marketing effectiveness and commercial success of the new drug. This proved to be a major challenge as it required the client to devise a long-term, holistic approach encompassing enterprise-level capabilities, technology, analytics, and data management skills. Request a FREE proposal to gain in-depth insights into our portfolio of healthcare analytics solutions. To gain the desired insights and to support the information needs of the oncology drugs segment, the healthcare analytics experts at Quantzig adopted a comprehensive three-pronged approach. The initial phase of this healthcare analytics engagement focused on analyzing patient datasets to offer a comprehensive view of patient journeys. Such an approach not only helped unravel the different facets of the oncology drugs landscape but also helped the client to better understand the current prescribing and utilization patterns, which, in turn, helped them identify physician practices that presented the greatest opportunity for improving patient care. In the second phase, a dedicated team of healthcare data analytics experts and data scientists were assigned the task of assessing the impacts of prescribed therapies and their clinical outcomes. Leveraging healthcare analytics helped bring about ground-breaking results by offering meaningful insights that empowered the client to further strengthen their drug development approach and improve the marketing effectiveness of the new drug. The third phase of this healthcare analytics engagement focused on leveraging predictive analytics to gauge the impact of the new product launch. The healthcare analytics solutions coupled with predictive health analytics offered timely, targeted insights that aided the client’s drug development process. Along with identifying the factors driving therapies, drug development, and treatment selection, the offered solutions also helped the client to identify barriers to utilization. Equipped with such granular insights the client was better positioned to gauge marketing effectiveness and the success ratio of its new product prior to its launch. Our healthcare analytics experts can guide you throughout the entire drug development phase. Get in touch to know more about the benefits of healthcare analytics. What is the role of healthcare analytics? Tremendous advances in the field of medical imaging, diagnostic screening, and molecular sequencing have accelerated the drug development process. Though a boon to healthcare players, such advances have further complicated the healthcare landscape and have given rise to major transformations across various healthcare segments. Data analytics helps address these challenges facing the healthcare industry. With the ongoing data explosions, the amount of data available to pharmacos are sufficient to bring about ground-breaking changes if analyzed appropriately. 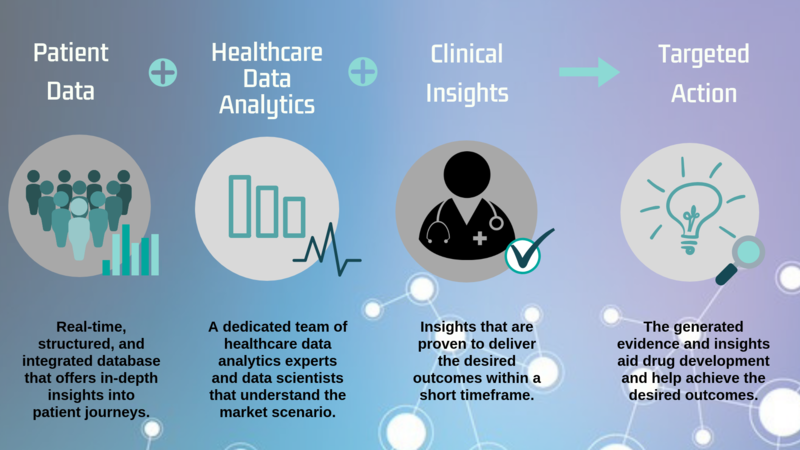 Quantzig’s healthcare analytics expertise combined with new methods of advanced analytics and data visualization, offer exactly this opportunity. Quantzig is a leading analytics solution provider that is well-known for assisting healthcare players across the globe to leverage healthcare analytics for prudent decision making. Today, our firm consists of 120+ clients, including 45 Fortune 500 companies. We recognize the importance of healthcare analytics in today’s complex healthcare scenario, but we also understand the necessity of finding pragmatic and efficient ways to iteratively build the required data governance framework. This is what set us apart from our competitors and prompts clients to engage with us on a recurring basis. Request for more information to understand how our healthcare analytics solutions aid in drug discovery and drug development.